Herbert James Draper (1863–1920), Ariadne (c 1905), oil on canvas, 100 × 77 cm, Private collection. Wikimedia Commons. In Ovid’s Heroides, Ariadne is in a class of her own. She’s the only one of his heroines who not only survives, but comes out of her crisis rather well, in the end. The daughter of King Minos of Crete, her half-brother (from her mother’s extraordinary bestial relationship) was the Minotaur. Her father blamed the Greeks for the death of her full brother, so demanded that they provided the Minotaur’s annual diet of seven young men and seven young women. The Minotaur was kept concealed inside the Labyrinth, an ingenious maze designed and built by the master artificer, Daedalus. Theseus was the son of King Aegeus of Athens, and decided to put an end to this attrition of young Greeks by killing the Minotaur. The only way that he could gain access to it was by including himself in that year’s batch of sacrificial victims. When Theseus arrived on Crete, Ariadne fell desparately in love with him. Ariadne came up with an ingenious plan to enable Theseus to make his way back out of the Labyrinth once he had killed the Minotaur: she provided him with a ball of thread, which he used to mark his route of entry. He could then retrace his steps along the line of thread and escape. In return for this assistance, Theseus agreed that, once he had killed the Minotaur and escaped, he would marry Ariadne. When it was Theseus’ turn to enter the Labyrinth, Ariadne held the end of the thread, he went in, killed the Minotaur, and found his way back to her. They wasted no time, and sailed immediately from Crete for Athens. On the way back, they stopped off overnight on the island of Dia (Naxos), where they appear to have consummated their marriage. The following morning, Theseus and his crew set sail before Ariadne had awoken, abandoning her on the island, as she watched Theseus’ ship heading towards the horizon. 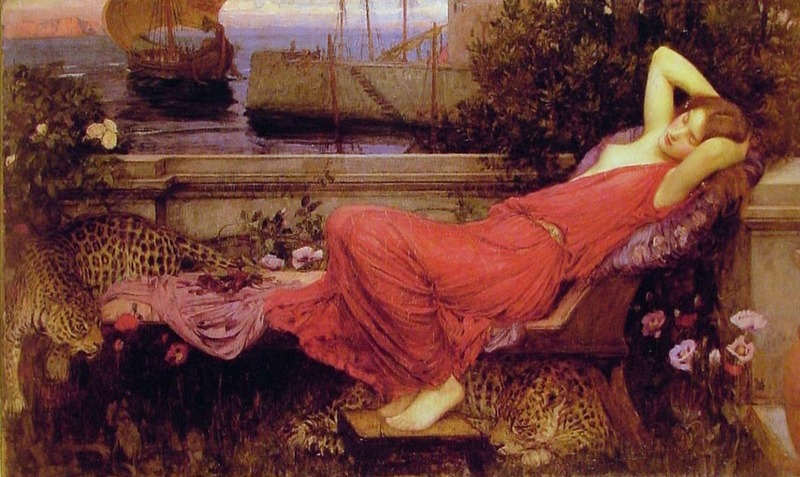 John William Waterhouse paints the moment that Ariadne (1898) starts to wake, as Theseus’ ship has just sailed. As she hasn’t yet realised that she has been abandoned, she lies back at ease. On and under the couch are a couple of leopards, a clear reference to the imminent arrival of Bacchus, although his chariot is more usually drawn by lions or tigers. Angelica Kauffman (1741–1807), Ariadne Abandoned by Theseus (1774), oil on canvas, 90.9 × 63.8 cm, Museum of Fine Arts, Houston, TX. Wikimedia Commons. 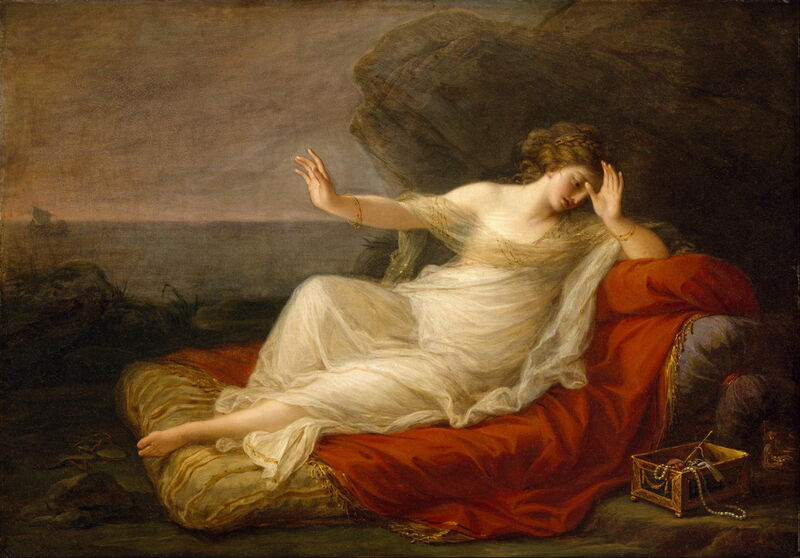 By the moment shown in Angelica Kauffman’s Ariadne Abandoned by Theseus (1774), she has seen Theseus’ ship heading back to Athens, and is now swooning in the realisation that she has been jilted. The painting which perhaps captures best Ariadne ready to write her letter to Theseus, is Paulus Bor’s Ariadne (1630-35). She looks desolated, is still undressed from bed, and clutches the thread with which she had saved his life, the thread which she thought held them together as a couple. Only now there is no one at the other end. Evelyn De Morgan (1855–1919), Ariadne in Naxos (1877), oil on canvas, 90.8 × 132.8 cm, The De Morgan Foundation, Compton, Guildford, England. Wikimedia Commons. 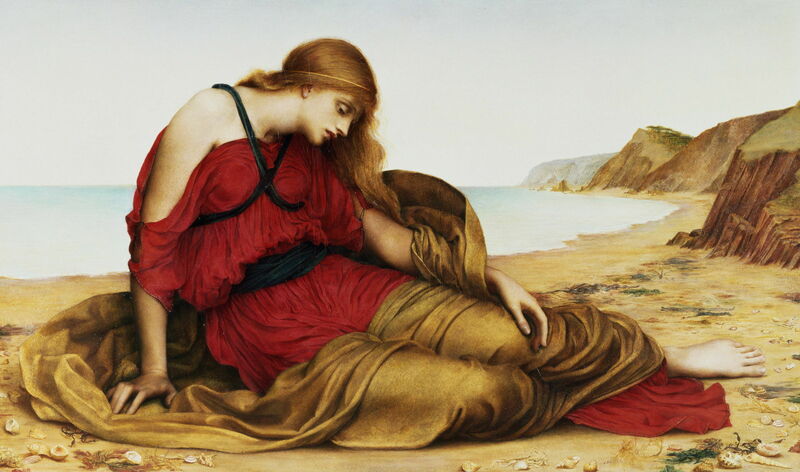 Evelyn De Morgan envisages her alone on the beach, in her painting of Ariadne in Naxos (1877). It’s possible that Ariadne had slept there, in the large brown blanket still wrapped around her legs, but there’s now no trace of her former husband – not even a sail on the horizon. The other painting which I think is truly Ovidian is Herbert James Draper’s Ariadne (c 1905). 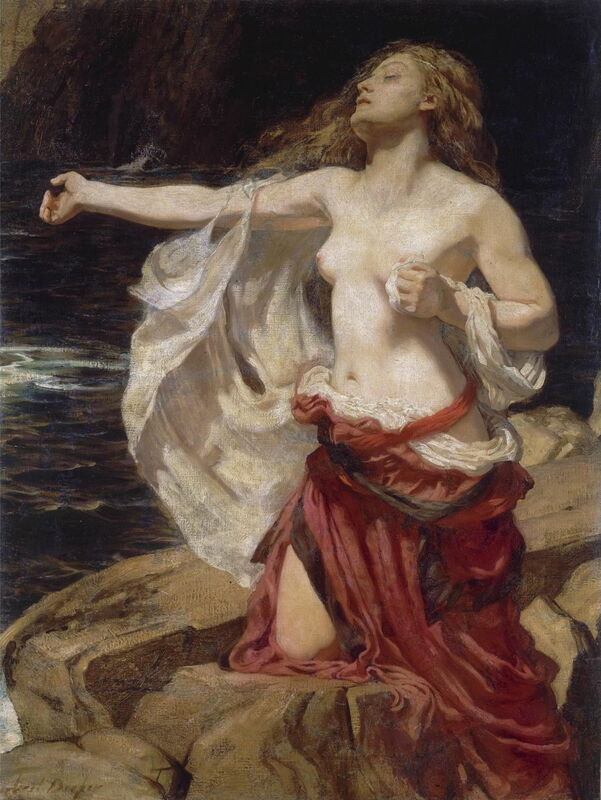 Still half-naked, kneeling on a rock by the sea, she beats her breast in the grief of Theseus’ betrayal. This is a direct reference to Ovid’s lines in Ariadne’s hypothetical letter. Ovid’s letter also contains some subtle allusions as to what happened next, but is written in ignorance of that. In a remarkable turn of fortune, who should turn up on the island of Dia/Naxos but the god Bacchus, who promptly marries Ariadne, and carries her off to Olympus with him. Maybe Bacchus’ lifestyle didn’t make him an ideal husband, but this was far better than the fate of Ovid’s other heroines. Eugène Delacroix (1798–1863), Autumn – Bacchus and Ariadne (1856-63), oil on canvas, 196 × 165 cm, São Paulo Museum of Art, São Paulo, Brazil. Wikimedia Commons. 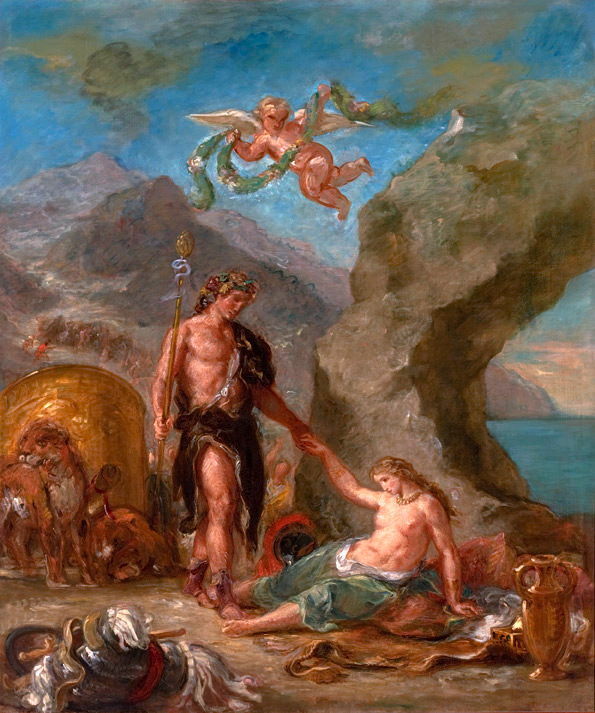 Eugène Delacroix’s Autumn – Bacchus and Ariadne (1856-63) shows the moment of his arrival, as he helps the despondent Ariadne back up from her gloom. Behind is his chariot, here drawn by lionesses. Jean François de Troy (1679–1752), Ariadne on Naxos (1725), oil on canvas, 163.3 x 130.4 cm, Musée Fabre, Montpellier, France. Wikimedia Commons. 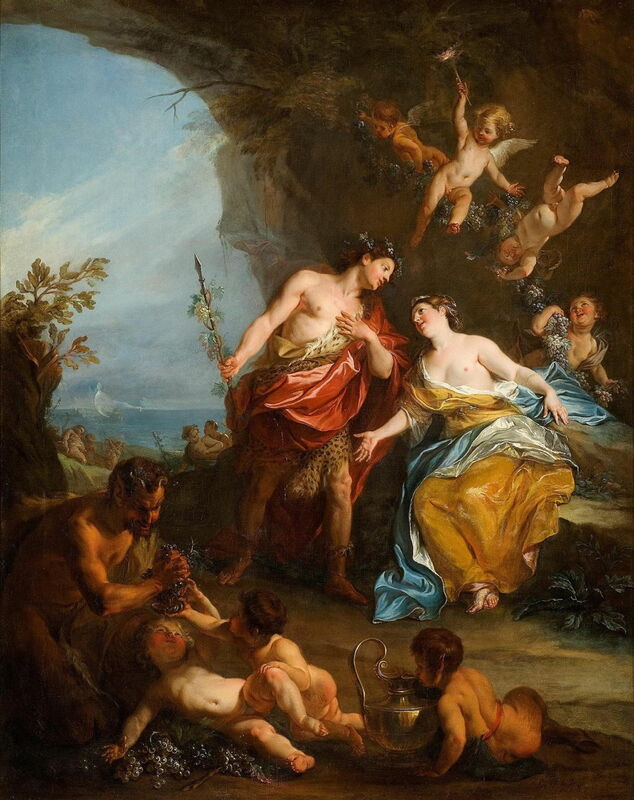 Jean François de Troy’s Ariadne on Naxos (1725) is the ideal romantic ending, the couple staring longingly at one another as putti cavort with fruit. But look carefully at what’s going on down at the beach, in the background. 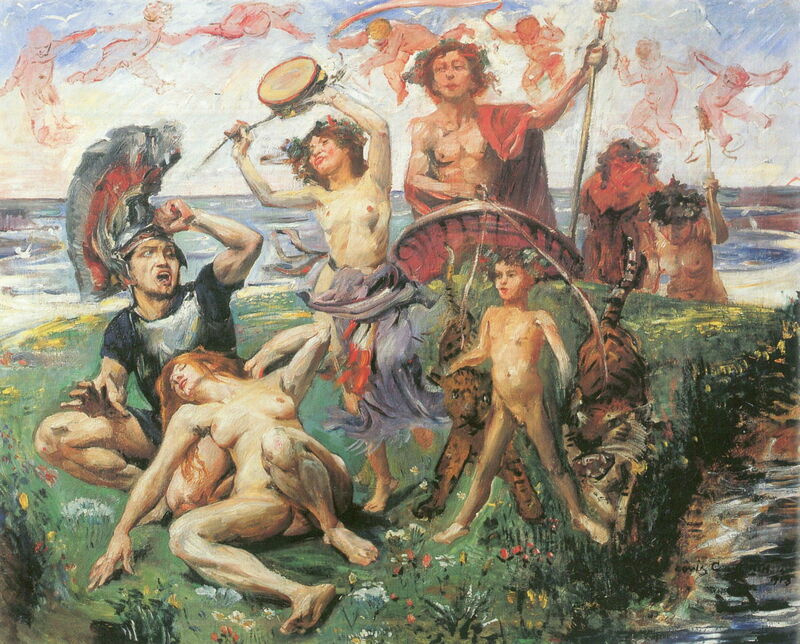 My favourite painting of this scene has to be Lovis Corinth’s vivacious and complex Ariadne on Naxos (1913). He uses multiplex narrative to tell the whole story, from Theseus’ betrayal at the left, to the arrival of Bacchus at the right. None, though, shows Ariadne’s revenge on Theseus. Theseus had made an elaborate arrangement with his father, the king of Athens, to signal to him the outcome of his mission. When Theseus had sailed from Greece, his ship had black sails. The agreement was that he would change those sails to normal white (or, more likely, tan) ones in the event that he had successfully killed the Minotaur. In his rush to abandon Ariadne, Theseus forgot to change the black sails. As the ship approached the Greek mainland, his father noticed this. Knowing that meant that they would have to continue sending young Greeks to their death on Crete, King Aegeus threw himself to his death from a cliff. Theseus was broken by grief when he realised that his carelessness had caused the suicide of his father. I wonder if Bacchus and Ariadne ever visited Theseus, to remind him how his treachery backfired. Posted in General, Language, Life, Painting and tagged Bor, Corinth, De Morgan, de Troy, Delacroix, Draper, Heroides, heroines, Kauffman, myth, Ovid, painting, Waterhouse. Bookmark the permalink.